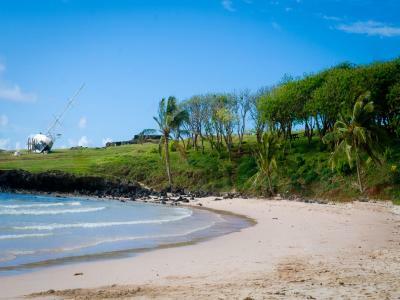 Lock in a great price for Hotel Hare Noi Rapanui – rated 9 by recent guests! Hare Noi is a larger nice property with mostly English speaking very nice Chilean (not Rapa Nui) staff. Rooms are large and clean with excellent bed and shower. Nice pool and restaurant, good buffet breakfast. At edge of town-good if you have a car or like tours. Not great for walking. Large public areas shared by 2-4 rooms. Decent internet in reception only. An incredible and relaxing stay in paradise. The premises are gorgeous and tropical and the rooms are large and beautiful. The staff is wonderful, eager to ensure that your stay is exceptional. Although the hotel is located about a five-minute drive outside of town, this only enhances the experience and stay in this remote and striking resort of just nine rooms. 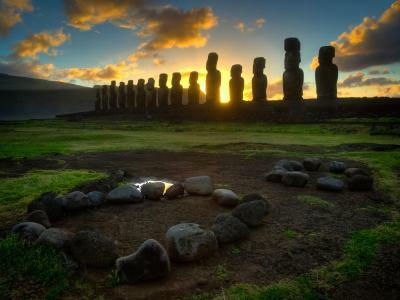 Hare Noi Rapanui was spectacular and we hope to be able to return again in the future. We can't recommend the hotel enough. the property was amazing and the people were incredible!!!! The Hare Noi was a short trip (5min drive) from the airport. The transfer with the hotel was very smooth and efficient. The breakfast was filling and fresh. Ignacio was fantastic in the mornings with great suggestions and an interest in learning more about what we wanted to see/do. We also booked a full day tour with Tito. This was fantastic as it offered the opportunity to learn more about the island and the history than we would’ve been able to get on our own. The hotel is super clean and with comfortable rooms! The breakfast was good and the dinner as well. This hotel is in the perfect position. Close to town and to the airport, but this is not a downside as there is only one or two flights a day and we never heard a plane, just makes it nice and easy to get to and from. We used the free bikes one day to go into town and to the museum and then other days walked to town which is an easy flat walk. All of the staff were so helpful and friendly. Great breakfast buffet. It was a magical experience. It was excellent, except that LATAM lost our luggage for 2 days.. but its another story. Hotel is great, staff is helpful and ready to help with any case. I liked the room and territory of the property, better than on photos. They have free airport transfer and free bikes. They have got all the information about intertaiment on the island and they can assist and book it for you without any additional cost. Recommend to rent a car, and they will bring it to your hotel. Staff was very nice and helpful. Good English spoken if required. Very nice place to return after exploring all day. Parking is convenient for rental cars and allows easy quick trips anywhere. 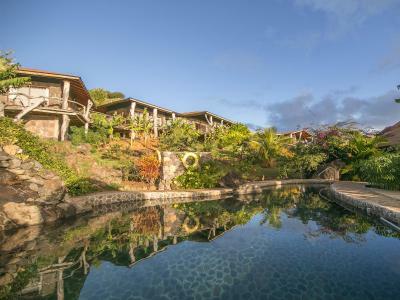 Hotel Hare Noi Rapanui This rating is a reflection of how the property compares to the industry standard when it comes to price, facilities and services available. It's based on a self-evaluation by the property. Use this rating to help choose your stay! One of our top picks in Hanga Roa.Featuring a spa, an outdoor pool and a restaurant, Hotel Hare Noi Rapanui offers accommodations in Hanga Roa. WiFi is available, connection is limited. Rooms at Hotel Hare Noi Rapanui were inspired by the homes of the first inhabitants of the island. They are decorated with parquet floors and stylish furnishings, and all feature a private bathroom. 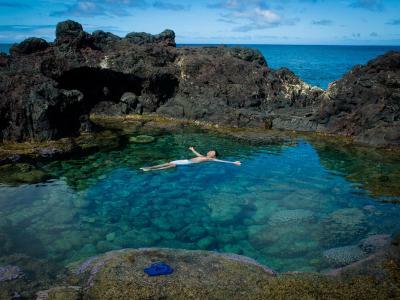 Guests can benefit from relaxing massages for an extra fee in the spa, which features a natural volcanic stone solarium. Excursions can be booked on site. 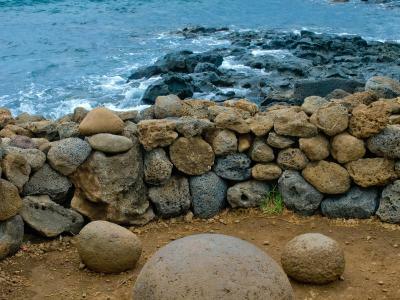 Hotel Hare Noi Rapanui is 11 mi from Anakena Beach and 1.6 mi from Mataveri Airport. Free parking is provided. When would you like to stay at Hotel Hare Noi Rapanui? House Rules Hotel Hare Noi Rapanui takes special requests – add in the next step! Hotel Hare Noi Rapanui accepts these cards and reserves the right to temporarily hold an amount prior to arrival. Please inform Hotel Hare Noi Rapanui of your expected arrival time in advance. You can use the Special Requests box when booking, or contact the property directly using the contact details in your confirmation. one stuff was not very nice when dealing with guests. Should improve his behavior and would be good to smile more often. Peaceful space, great views and meals. Attitude of staff appalling. Very cold pool. Expensive restaurant, laundry. Slow service. Rooms not that clean. Not much. Easy location to airport. Breakfast ok.
We had booked trips through the hotel and I think that the person that was responsible for that forgot so there were a couple of problems but it was taken care of the next day by another staff member. Good location close to town, food and services at the hotel was good, I would recommend this hotel to friends and family. The hotel is set in beautiful well tended gardens. It comprises several lodge type individual buildings with there own verandas that are all lovely. The bedroom has very efficient air conditioning which you can turn on or off as required. The staff are lovely and help in any way they can including getting a taxi for you if needed into central Hanga Roa which currently costs 3K pesos (just over £3) one way. The fare back if late can cost a little more. Dinner in the hotel restaurant is very good, breakfast is excellent. 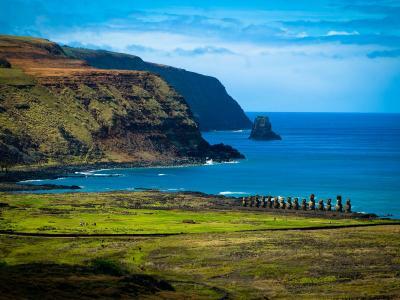 Rapa Nui people told us that the hotel is owned by the long term mayor of Rapa Nui and Chilean investors and that in building it they destroyed one of the 2 obsidian quarries used to make tools and weapons in ancient times. We were never able to find exactly where the quarry had been, but although they deny cultural genocide, everyone there agrees the property was the major obsidian source. It is against the law to take ANY, but even if you don’t stay there, climb to behind their highest buildings and you will see large obsidian chunks all over the ground! Very cool. Sad they weren’t able, or chose not to, save and display the quarry. Everything ! 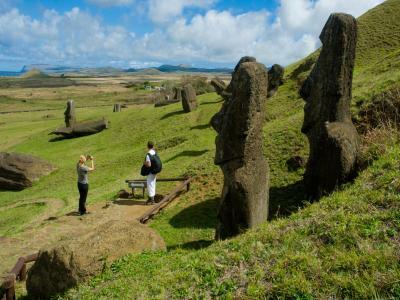 This is the perfect place to be at Easter Island. A 9-room top hotel with an excellent restaurant and people who care to make the most out of your trip. Thank you Thierry, Ignacio, Angela and all others at Hare Noi. 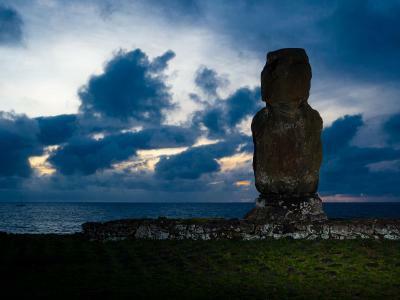 Happy Tapati 2019 (Easter Island festival taking place on February 1-15) !!!! Wonderful relaxed hotel, rooms are in blocks of four scattered throughout grounds. Restaurant v good, breakfast service could be random. Having to deal with a staff member seemingly having a bad day always. But the place, the location, the restaurant were all great and made up for the matter. The WiFi connection is poor. The hotel is set in an ideal place with awesome views and setting. The staff was helpful and eager to help with the possible exception of one who seemed to be having a bad day always. As stated, we had a great stay at Hare Noi, but it should be noted that the management seems to have lost their focus on the little things. We appreciated the eco-focus if the property and didn’t mind not having a/c, but the screen on the sliding door didn’t actually for the door to keep mosquitoes out. We had to improvise with towels to fill the gaps. General upkeep of room elements should be reviewed (drapes are worn and ripped, shower drains covers come off easily, toilet seats are not secure etc.). Also, some may want know that the property is no longer part of the Noi group (this was pointed out to us when we were at another Noi property in Chile). Given the reputation of the Noi properties, everyone should go in eyes wide open that it may not be to that standard. Again, our overall stay was fine, and we states the same feedback provided here in our survey that was given to us at check-our so there shouldn’t be any surprises to management.